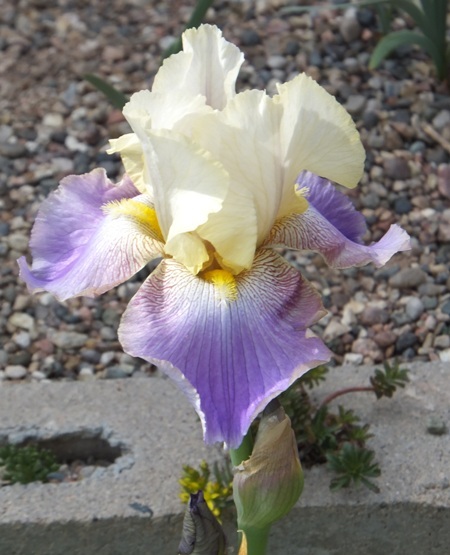 Two years ago, when I ordered my first irises for the garden at our new home, I didn’t know I would resume my iris hybridizing hobby. The cultivars I bought were mostly selected for sentimental reasons, and to produce a pleasing effect in the back garden. 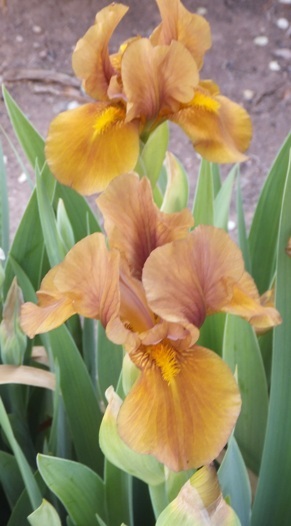 Since then, I have been ordering irises based on their relevance to my breeding plans. Still, I want them to fit into an esthetic garden design and mingle with other plants. 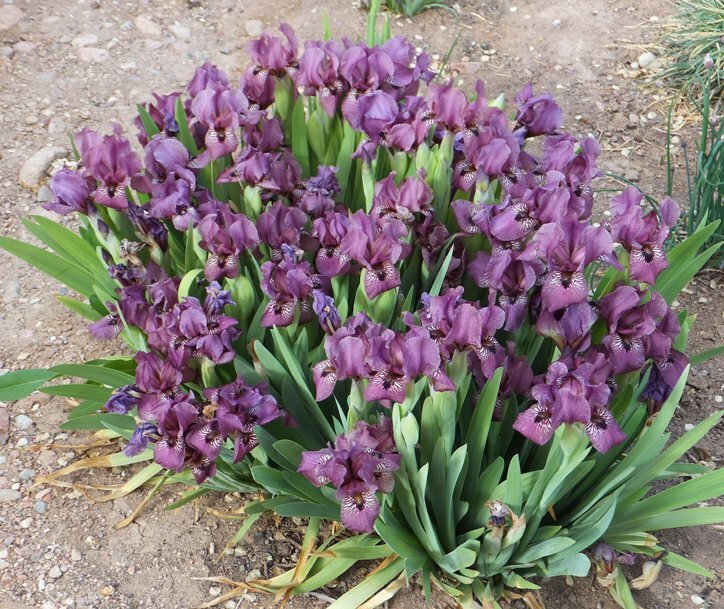 It’s easy to just keep ordering more and more new ones, but I’m keenly aware of the resources required (time, labor, and water) to maintain a garden, and so I am determined not to go the route of many iris enthusiasts and acquire so many irises that there is room for nothing else to grow and no way to care for them all properly. Therefore, it is necessary to remove some to make room for new additions. I thought I would write a little something about how I made these difficult choices. 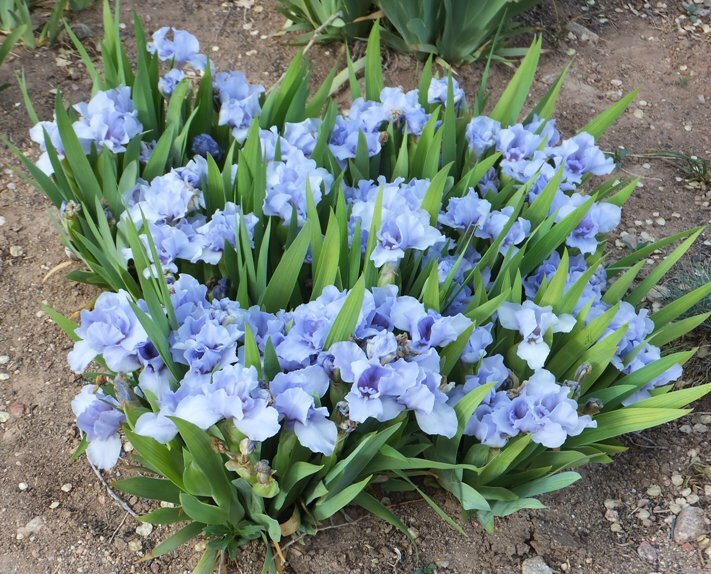 Besides the quality of the irises themselves, I also took into account that I am moving toward a “cool pastels” color scheme in the back garden where these first acquisitions were planted. I had three miniature dwarfs: ‘Alpine Lake’, ‘Cradle Blue’, and ‘Snowy River’. They each have something to recommended them. 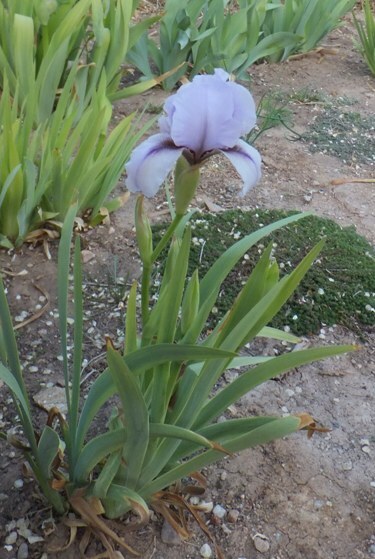 ‘Cradle Blue’ is the first to bloom. ‘Snowy River’ blooms over the longest period of time, with dainty wildflower-like blooms that I enjoy. ‘Alpine Lake’, though, puts on the most intense display, with lots of flowers opening at once. It was my choice to keep. It having both white and blue in its coloring was a plus as well. (The other two are selfs.) I will keep five rhizomes and replant them in a drift. I have five of these: ‘Sea Monster’, ‘Michael Paul’, ‘Rain Dance’, ‘Orange Tiger’, and ‘Baby Blessed’. ‘Orange Tiger’ was easy to eliminate. It has nice orange color, but the stalks are short and the plants small and weak-looking. It hardly bloomed at all in its second year here. ‘Sea Monster’ has interesting color and is a bit more modern-looking than the others, but nothing I can’t be without. ‘Baby Blessed’ rebloomed for over a month last fall, but I found I didn’t enjoy it all that much, tired-looking blooms down in the aging late-season foliage. It’s form is mediocre and substance poor. ‘Michael Paul’ has wonderful intense color and good growth habits, and happens to share a name with Karen’s son, but in the end I opted to keep only ‘Rain Dance’, which not only has a lovely color that fit my color scheme for the garden, but was also the best performer of the lot. I have IBs ‘Rare Edition’, ‘Hot Fudge’, ‘Shampoo’, and ‘Obligato’, and BB ‘Butterscotch Blush’, as well as the historic ‘Mme. Chereau’. I’ve always loved ‘Rare Edition’ and it is a fine performer, but it bloomed on too-short stalks this year, as did most of the other IBs. ‘Obligato’ did a great job enduring last spring’s awful weather, but the individual blooms didn’t impress me very much. ‘Hot Fudge’ had small blooms down in the foliage, which made it hard to take much notice of. 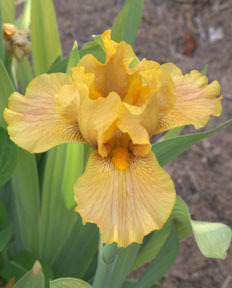 ‘Shampoo’ was the winner with perfect stalks and nicely shaped blooms. Besides, Karen likes brown. ‘Butterscotch Blush’ is also a keeper: gently ruffled blooms of gold with just a hint of pink blended in, and a lovely clump effecct. ‘Mme. Chereau’ will also stay for her old-fashioned charm and durability in the garden. I ordered ‘Loudmouth’ and ‘Loud and Rowdy’, a 2010 introduction of Sharon McAllister. The folks at Malevil gardens remember that I was a friend of Sharon and sent me others of hers as gifts: ‘Mohric Mystery’, ‘Go Big Red’, ‘Honey Not Tonight’, and ‘Navajo Velvet’, as well as Paul Black’s ‘Brash and Bold’. ‘Loudmouth is a definite keeper, delightful, vigorous, and floriferous. I’m also keeping ‘Mohric Mystery’ for its elegant form, nice stalks, and pastel coloring that fits my color scheme. Of the others, I decided to keep ‘Navajo Velvet’ for its strong colors, sturdy tall stalks, and good plant habit. I love the blooms on ‘Honey Not Tonight’, but it sent up long weak stalks that went sprawling in the first wind. ‘Go Big Red’ was nice too, but bloomed quite a bit shorter than ‘Navajo Velvet’, and so makes less impression in the garden. ‘Loud and Rowdy’ was pleasant enough and has no real faults, but it just didn’t speak to me. Also smaller than ‘Navajo Velvet’. I have a first-year plant of ‘Brash and Bold’ elsewhere in the garden, so I don’t mind eliminating it from this bed. 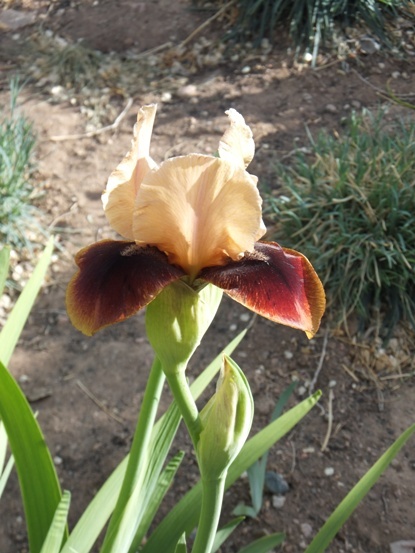 I have two of Gus Seligmann’s irises that I introduced in 1983: ‘Catchy Name’ and ‘Satan’s Mistress’. I would be keeping these for sentimental reasons in any case, but ‘Catchy Name’ actually performed better than the other TBs in this bed, with many blooms and tall sturdy stalks. 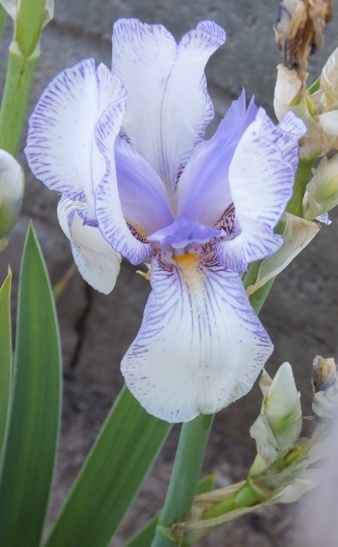 The others, ‘Enchanted Mesa’, ‘Azure Whir’, and ‘Summit Angel’ had blooms that were pleasing enough, but bloomed on stalks no taller than the medians, looking quite out of proportion. 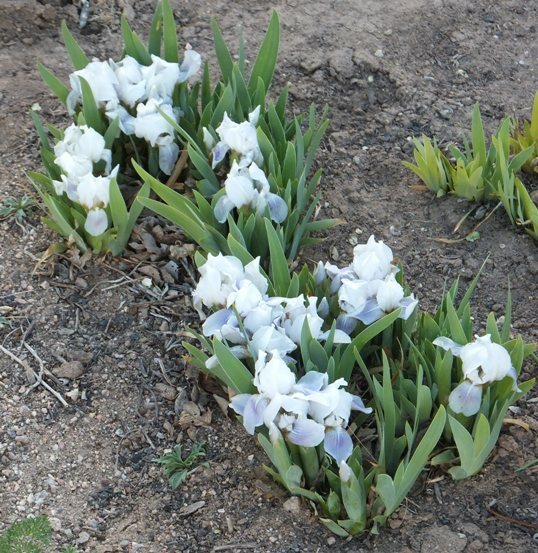 This is something that our warm weather makes irises inclined to do here, but I prefer to keep the ones that develop tall stalks in spite of the weather. I also have ‘Beverly Sills’, which did not bloom in 2011 and put up to scrawny little stalks this spring. It’s clearly not established itself here, but I decided to be kind and give it one more year to settle in.